Make no mistake, iAds are the iPhone user's worst enemy. 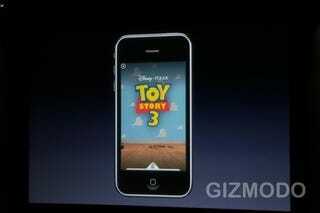 If Buzz Lightyear were at the unveiling, he'd have rocket punched Apple right in the face. With today's announcement of iAd, a turnkey solution for developers to add advertisements to their applications, Apple has empowered the small developer to be rewarded (assumably) every single time a person uses software—all without building an internal ad sales team of their own. It's pretty neat, from a business perspective. From a user's perspective, it's absolutely horrifying. This point may sound hypocritical. After all, I write for a major website that makes a lot of money off the ads you see (and sometimes, ugh, hear). But there are many differences between what Apple is doing and what exists in the advertising world as we know it. For one, software has almost always been an ad-free space, a sort of neutral zone in the war for a consumer's heart and mind. Aside from a few instances (like Madden advertising real products on in-game billboards), if you bought a piece of software on a cellphone or a PC, it was free from ads. If you downloaded a free piece of software on the PC, it might have an ad, but usually it was just to get you to buy the software—and it usually didn't sit on the screen at all times. Which brings me to my second point about why iAds look particularly sinful—even when ads appear on the web (or most PC-based software) now, you're talking about a relatively small image, in terms of overall real estate, that you can escape by scrolling down a page. That TiVo ad in the upper right hand corner of Gizmodo? (You may or may not see it—I have no clue what sort of deal our sales department has cut with them.) You could fit almost 30 of those ads on the 24-inch monitor I'm using right now to read Gizmodo—and I have a second laptop monitor on which I can hold even more information. But on the iPhone, bar ads (like we see in iAd) take up roughly 1/8th of the screen at all times—a screen that's designed to be tiny so that it can fit in your pocket meaning that most of us struggle to read the thing in the first place. As far as I'm concerned, that particular ad is sucking away 1/8th of my experience, jamming its nose in my portal to a device that I paid (a lot) to own and use. 1/8th is too much in my book, and it infuriates me that the guy who sold me this phone is the same guy selling someone a means to take part of that phone from me. We shouldn't expect any apps to stay ad-free, at least when keeping history in mind, because Apple has made no restrictions (that we've heard about) to keep ads out of paid apps. Remember when cable was a safe haven from broadcast ads? Then what happened? Basically every cable network followed the broadcast advertising model. Now, we have ads on everything on TV. And after we learned to skip them, we've developed ads in our TV—superfluous product references integrated into a storyline for no other purpose than profit. But there's a difference between television advertising, in its current state, and Apple pitching every developer on integrating its ad solution. Apple selling iAds is the equivalent to Sony or Samsung selling part of your TV to advertisers, not a content provider—artists gone businessmen, essentially—like NBC cutting into their own programming to sell you a product and fund said programming. You see, it's not that I don't think anyone should have the right to advertise through my phone. If NYT puts an ad in their app, I understand. They constantly generate non-reusable content. The NYT is not a piece of code that's written once, like DoodleJump; it's a publication that's built from the ground up every day. Apple's already built, shipped and more than funded the iPhone they sold you—in both a for profit sale and the healthy chunk they're taking from AT&T's monthly bill. Now they want part of that phone back—1/8th to be exact—and they're pitching every platform developer along with every consumer on the idea. Hopefully, developers will see "ad-free" as a selling point, and we won't be so dim-witted as to be sold on anything less.